Wallace briefly discusses her college years when horses were not part of the picture, then on to motherhood and the eventual need to "get out of the house," where she again found herself in the company of horses. She began with a "schoolmaster" (a safe, older horse), and worked her way up to a younger and somewhat less predictable equine. Always in the back of her mind were the "what ifs" and her struggles with confidence. Still, her time at the barn was an important part of her life and soon she was bringing her children along with her to experience the joy of riding. Watching her girls ride helped Wallace pursue her own dreams of riding, as well as realize just how wonderful spending time at the barn was for all, while still, at times, fighting the fear of getting hurt. 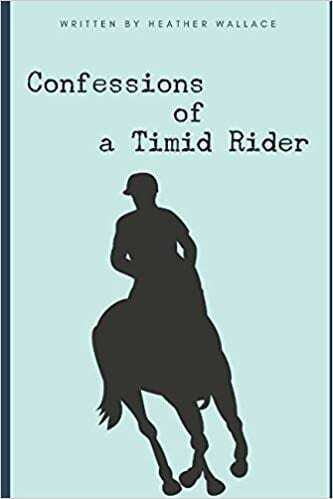 Quill says: Confessions of a Timid Rider isn't just for horse enthusiasts but for all of us who have struggled with thoughts of fear, of being afraid to try something new, and of fighting the urge to let the fear of failure keep us from achieving our dreams.